If you are a firefighter then you are probably aware of how rigorous, tough, and dangerous the nature of your job is. In fact, your job exposes your hands to more collateral damage compared to other areas of your body. Fortunately, it is possible for you to give your hands maximum protection with the best firefighter gloves. You need one to give your hands the ultimate protection from safety hazards around you while you are doing your job. Keep in mind that this glove plays a crucial role in the lives of every first responder, rescuer, or firefighter. The best one is actually capable of keeping your hands safe while staying flexible so you can move freely when rescuing people. Even with the dangers revolving around working as a firefighter, you can still be at peace, knowing that you can safeguard your hands from the dangerous flames. Just ensure that you go for the best structural firefighting gloves that can also protect your hands from abrasion while delivering adequate comfort, dexterity, and finger motion. It should also fit well while promoting excellent performance. To ensure that you make the right choice, here are short firefighter gloves reviews that will help you determine which one is really worth investing in. These ten products belong to the best firefighting gloves at present, making them deserving to be taken into consideration when you are still shopping for the right one. One of the firefighter gloves that anyone interested in it should check out is the Ringer Gloves 345 Rescue and Firefighter Extrication Glove. I am truly delighted to introduce this pair as it is truly a great option in the protective gear industry. In fact, it is meant for all first responders and firefighters out there who wish to receive full protective coverage on their hands, fingers, and knuckles. I specifically like the heavy-duty built of this glove. It is cut-resistant plus it is effective in supplying thermoplastic rubber (TPR) impact protection on your knuckles. I am also very happy with the detached finger style integrated into this glove as it promotes a high level of flexibility. It is one of the sturdiest pairs of glove today, thanks to its strong construction and Kevlar reinforced stitching. It also further maximizes its ability to offer protection with the aid of its KevLock padded fingertips and palm panels. I am also one hundred percent satisfied that this protective glove is built to be reflective and visible. This further increases the safety of first responders and firefighters who wear it as it promotes better visibility. 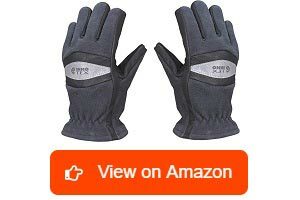 You can also expect this glove to provide you with a high level of security and comfort with its locking cuff closure, which also boasts of a hook and loop feature. Furthermore, it has a 2-layer fingertip design, which maximizes the tactile feel while retaining good dexterity. However, some say that the stitching used in this glove is not that great. The stitching is not that great. This glove carries several remarkable benefits for firefighters, though, allowing it to instantly make up for its minor flaw and deliver incredible performance and protection during rescue operations. The next glove I intend to review is the Alpha X NFPA Firefighting Glove offered by Dragon Fire Gloves. What I find so fascinating about it is that it serves as an all-in-one solution capable of providing the highest level of protection and resistance, especially when dealing with blood-borne pathogens, chemicals, abrasions, punctures, and extreme heat and cold. I also find its overall construction impressive because it offers security in the most critical areas, including your fingertips, palms, and knuckles. It also provides a hundred percent guarantee that it can deliver superior dexterity without sacrificing its ability to offer protection. Another reason why I love this glove is that it works without hardening nor stiffening. In fact, it stays pliable and soft even after using it repeatedly. This assures you of comfort even when used for long hours. While it is soft and pliable, it still guarantees the users of its ability to remain durable and long-lasting. The upper layer of this glove is even wrapped using double Kevlar stitching, making it stronger and sturdier than ever. The superior heat blocking ability of this glove also impresses me. This ability is what its thermal liner can regularly promise to its users. This inner liner also makes it useful in the fire service and rescue department. The outer shell of this glove is constructed from natural leather, which is popular for its strength. The fact that it does not use any fabric on the outer shell also ensures that it showcases a strong grip, especially when used on wet surfaces. I am fond of the overall ergonomic design of this glove, which is known to be anatomically accurate. However, you may need to spend some time breaking it in before you can start taking full advantage of its many capabilities and positive benefits. After that, you will start to appreciate the overall performance and quality of this choice for the best Dragonfire gloves, especially when it comes to supplying your entire hands with the highest level of protection. The Ringers R-314 Extrication Glove is also one pair of glove for firefighting that I wish to recommend to anyone who needs it. 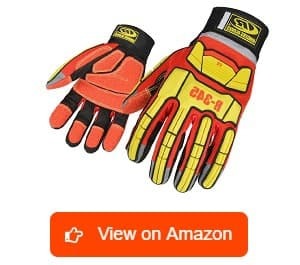 The superior hand protection promised by this extrication glove is one reason why I think this is the ultimate choice not only for firefighters but also for oil riggers, gardeners, and those who work using chainsaws. It is truly protective and functional that it boasts of its impact-proof and cut-resistant construction. Another strength of this glove is its highly versatile TPR impact protection, which main function is to keep your fingers and knuckles protected from various safety hazards. It offers such kind of protection while also ensuring incredible visibility. Constructed out of synthetic leather combined with EVA padding, rubber, Armortex, and stretch Cordura, I am also quite sure that this glove will not cause any disappointment in terms of supplying puncture and cut-resistance. I am also very satisfied with the built-in reflective markings in this glove as it promotes a high level of visibility. Another strong advantage of this glove is that it promotes an improved grip, thanks to the KevLoc system used in its palms and fingers. I can also vouch for the comfort delivered by this glove. I think that its extreme comfort is attributed to its well-padded palm. I super love the Kevlar stitching used in this glove, too. Furthermore, it can prevent debris from penetrating within because of its extended cuff, which also features a gaiter closure. However, you have to prepare for the initial stiffness that you might experience when using it for the first few times. Overall, this firefighter glove is definitely meant to make the jobs of rescuers and firefighters even easier to manage while giving them fewer things to worry about since they know that their hands are well-protected. Protech-8 gloves are also among those protective gears for the hands designed to truly satisfy most of its users. One glove in this product line that grabbed my attention is the Protech-8 Fusion Structural Firefighter Glove. It was an instant hit in the firefighting industry after it was introduced because of the many positive traits that it holds. One of these is it being cost-effective. It is mainly because even at an affordable price, most of its users can still enjoy a glove, which is not only protective but also speaks volumes in terms of quality and performance. I also find its full lining constructed from Kevlar a strong advantage because it further increases the cut-resistance of the glove. 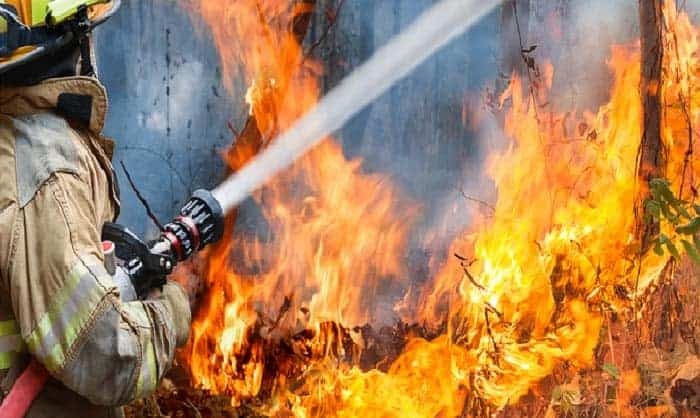 It has superior dexterity and flexibility, which is a favorable advantage for those who would like to move with ease and minimal effort when they are doing their job, especially during a firefighting operation. It also fits well plus it promotes a strong and secure grip in almost all types of work environments irrespective of how tough it is. I am also one hundred percent satisfied with the advanced and modern multi-layer design used in this firefighting glove. It is because it works in reinforcing the vulnerable parts of the glove, making it stronger and even more protective. It even takes pride in its exclusive and unique knuckle guard. Another thing that this glove can promise to its users is its superior comfort, which is brought on by its softness and flexibility. It utilizes the brand’s moisture barrier, which is effective in providing maximum viral and chemical protection while maintaining the dryness of your hands and a great amount of breathability. However, take note that this glove is still prone to shrinking over time, which is the primary reason why you should consider getting one that is one size larger than what you normally use. With the incredible performance and protection delivered by this glove, this ProTech-8 Fusion glove will surely impress most of its firefighter users. I also like to suggest using the KKmoon Fire Protective Glove for firefighters. I noticed that it is one of those waterproof firefighter gloves that captured the interest of several fire respondents and professional firefighters because of the many capabilities and functionalities that it holds. It appears to have adequate durability, allowing it to last for as long as possible. Another thing that interests me about this protective glove is its rugged palm, which sorts of proves its toughness. With that, I am quite sure of its ability to withstand numerous harsh environments and tough fire emergencies and rescue operations. It is appropriate for firefighters because it is built to be fire-protective while also being flame-retardant and resistant to acids, oils, static, radiation, and heat. With all these properties and capabilities, I can rest easy, knowing that it will not put my hands in danger. 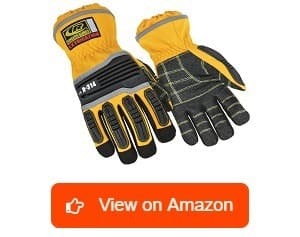 The primary material used in creating this protective glove is also both cut-resistant and non-slip, which indicates how effective it is in protecting your wrists and hands from cuts, scratches, and other safety hazards caused by being exposed to dangerous work environments. 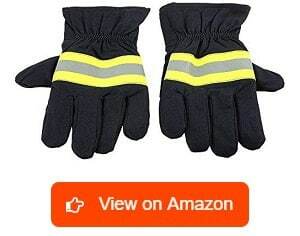 It is also one of the most flexible and comfortable gloves for firefighters and fire respondents that you will find easily accessible in the market. Furthermore, it has a reflective strap, which improves both your safety and visibility. However, one of my minor complaints is that it is sized smaller than usual. Overall, I love the well-built and solid construction of this protective glove, as well as how it maximizes its ability to offer protection based on the properties and features that are integrated into it. 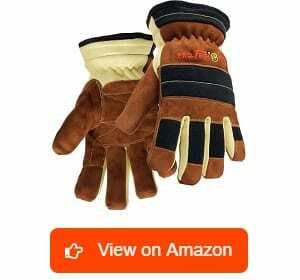 Another pair of heavy-duty firefighter glove that is worth checking out is this product offered by Swany. This continues to impress me because of its proven heavy-duty construction, allowing it to show its toughness and ruggedness regardless of where you intend to use it. One thing that genuinely grabbed my attention is the approval provided by NFPA. This glove is actually approved and well-rated by the NFPA for use in the field of firefighting and fire responding. It has an outer shell made of suede material, which, I think, is enough to provide the perfect balance between strength and comfort. It is well-insulated and breathable, too, giving your hands the chance to stay dry and cool. The fact that it has proper insulation and breathability also means that you can prevent your hands from sweating out. 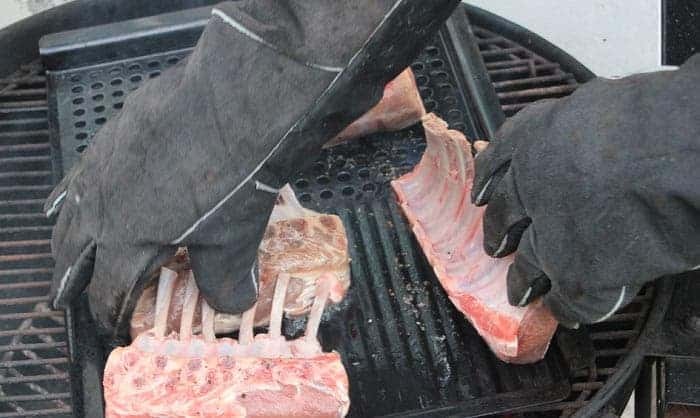 Another plus point of this protective work glove is that it is waterproof, which proves how effective it is to use no matter what the weather is. I am also impressed with the great pliability and strong grip of this work glove. In fact, I find it easy to grip on woods effortlessly with this glove on. It has a decent price while showcasing a product, which prioritizes quality. It also delivers its promise of being fire-resistant and heat-resistant well. 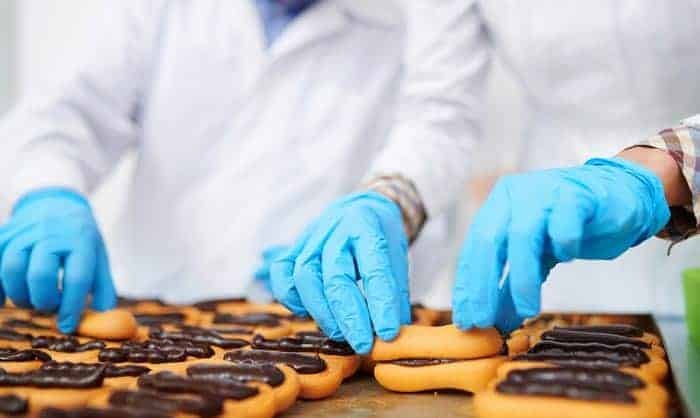 In fact, you can wear it when you need to maneuver hot items without worrying about getting your hands burned or injured along the process. 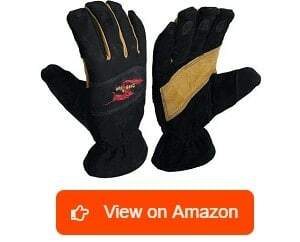 However, this work glove is not that appropriate to use in welding or any other situations where a tight grip is necessary because of its tighter than usual finger circumference. Despite that flaw, I still think that this glove delivers incredible performance for firefighters and fire respondents who need something, which is primarily designed to offer maximum protection to their hands. I am also delightfully satisfied with the Innotex INNO-775-M TRU-3D Firefighter Glove. In my opinion, it has the majority of the things that any firefighter looking for incredible hand protection is searching for. It is a firefighter glove, which holds a really nice and functional design. In fact, it is designed for firefighters in a way that it provides complete elements for all the sides of your fingers and thumb. It comes with curved thumbs and finger as well as rounded fingertips – all of which are useful in ensuring that users will feel comfortable and secure when they are wearing the glove. I also find this firefighter glove awesome because of its improved flexibility and grip brought on by its formed knuckle guard. This specific feature also provides the added benefit of minimizing hand fatigue, which is one of the most common issues faced by firefighters and fire responders who are on the mission of saving someone. Another thing that impresses me about this glove is its thermal lining, which, I think, did a really excellent job in terms of offering heat protection. Moreover, it has inserts designed to offer more than enough dexterity in the palm. Another strength of this glove is its additional thermal protection, which is integrated at the back part of the hand. I would also like to highlight another awesome benefit offered by this glove, which involves promoting more natural movements. It is mainly because of its full 3D design, which also guarantees enhanced tactility and grip. However, it also carries with it one noticeable flaw, which involves its somewhat high price tag. With the many positive attributes of this firefighter glove, though, you can instantly regain the amount you spent for it. Another product that earns a spot in this article is the Protech-8 Titan Glove. What I like about this glove is that it seems to offer the ultimate answer to all the things that a firefighter is looking for in terms of hand protection, including grip, fit, comfort, flexibility, and dexterity. I super love the overall flexibility of this glove, which is proven by its ability to handle all fire ground tasks that you are tasked to face in an effective manner. It can even deal with basic motor extrication tasks well. I am also very happy with its advanced and modern design boasting of its multiple layers. I find this design effective in reinforcing the vulnerable features and areas of the glove, making each part as tough and sturdy as possible. It also boasts of its unique knuckle guard, which further enhances the durability of the glove. 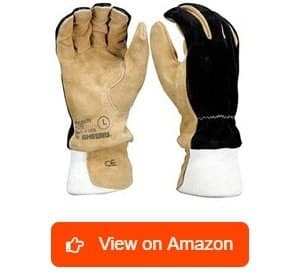 Also, I feel delighted to know that this glove is made while complying with all the standards set by NFPA in terms of making firefighter gloves. This is the reason why this glove comes with a barrier, which can resist blood-borne pathogens and fire-retardant moisture. Furthermore, this glove offers the highest level of dexterity possible, thanks to its versatile Nomex and Kevlar finger sidewalls. The additional cut-resistance brought on by the full Kevlar lining also left a positive impression on me. However, what I do not like about this glove is that it is slightly tight when I first used it. I was able to resolve this issue, though, after breaking it in. Eventually, the fit will become even better, giving you the chance to savor all the positive traits offered by this glove, including its ultimate protection and comfort. 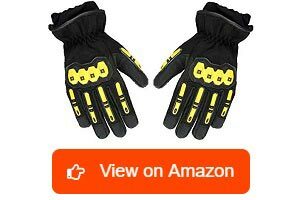 If you are wondering whether there are Shelby work gloves designed for firefighters then you will be delighted to know that there are actually some gloves from this brand that meet your specific requirements. One of these is this pair of Shelby structural firefighting gloves mainly constructed from pigskin leather. One of the most amazing benefits of this Shelby firefighter glove is its awesome dexterity. I noticed that it is primarily due to the dual thickness used in the areas surrounding the keystone thumbs that were angled to the palm. I am also very happy about the pigskin leather used in its construction as it is the ultimate solution to strength and durability. I like the fact that this glove prevents hot debris from penetrating inside, which is the key to keeping your hands safe from them. I think that the built-in Nomex wristlet contributes a lot to this capability. I am also impressed with the nice and fine fit showcased by this pair of glove. The fit is so perfect, giving users the opportunity to move freely, effortlessly, and comfortably. It does not also seem to disappoint in terms of performance as well as in providing maximum protection to those who are serving in the fire rescue department. Another plus point of this pair of a glove is that it is waterproof, so rest assured that you can safely use it in various scenarios, whether it is raining or snowing. The breathability of this glove is also very noticeable. However, it seems to be lacking in a proper lining, which is one of its weaknesses. Still, this Shelby glove is one of those structural firefighter gloves that speak of quality right from the moment you see it, so it is definitely worth paying for. Lastly, I am recommending this hard knuckle protective glove from Hugger Glove Company to firefighters looking for the ultimate hand protection. It is made to be fire-resistant, which just proves its excellent performance and effectiveness when used in the firefighting scene. With the leather and durable fabrics construction, I am sure that it will not leave its users feeling disappointed as it can give them peace of mind when offering their services. I specifically like the inner lining, especially the Kevlar material used in it, because it is fireproof. It is designed to help your hands remain safe and fully protected. 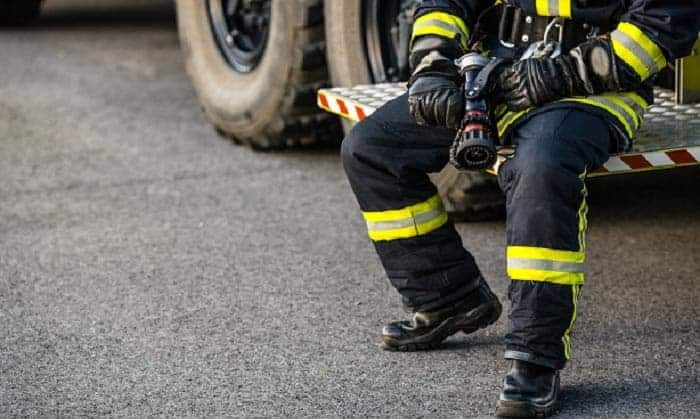 Most firefighters and law enforcers also prefer it but the overall versatility of this pair also makes it ideal for other purposes and operations. It offers more than sufficient comfort considering the fact that it is made to adhere to the actual shape of your hands. Due to the polyester fiber hand back featured in this glove, it will also further enhance the overall experience of any user as it promotes softness and utmost comfort without losing the item’s strength. The only issue I noticed in this protective glove is that its sizing is slightly off/inaccurate so you really have to figure out which one fits you well before buying. Overall, this protective glove features almost everything that firefighters are hoping to see and enjoy in their hand protection solution, so I can safely conclude that it is a smart decision to invest in it. As its name suggests, a pair of firefighter gloves is primarily designed for all firefighters in different parts of the world. In most cases, these gloves are built to be heat-resistant and fire-resistant, making it perfect for those who work as firefighters or those whose jobs expose them to heat or flames on a constant basis. High-quality firefighter utility gloves can be expected to help keep your hands fully protected from flames. You can find some of these gloves being used by fire brigades. They are also built in a way that they adhere to the regulations and standards set for structural firefighting. 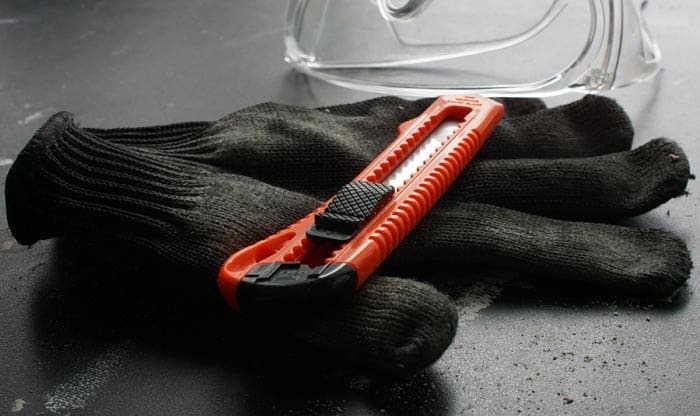 This form of hand protection is useful in all kinds of fire evacuation emergencies. As a firefighter, you truly need to keep your hands protected with the help of a pair of glove. In most cases, the best structure fire gloves are constructed using flexible materials that anyone will find useful during a fire rescue. It is built while keeping in mind special standards and requirements necessary in building one. With tough and high-quality protective gloves, firefighters, like you will feel more at ease when performing their tasks because they know that they are safeguarding themselves from the harmful flames. Fully functional and high-quality firefighting gloves are also those that gained the approval of the National Fire Protection or NFPA in terms of using it for structural firefighting operations. They are meant to safeguard your hands, preventing possible injuries while you are doing your job of fighting a fire and rescuing those who need your help during this emergency. Firefighter gloves work by ensuring that firefighters and rescue workers remain completely safe and protected on the job. Note that as a firefighter, you often expose yourself to deadly situations and scorching temperatures, especially during rescue operations. With that in mind, it is vital to get a pair of gloves from the most reliable brands. Aside from protecting you from fires and other harmful situations, the gloves also work by letting you obtain maximum dexterity. This is the key to ensuring that you will be able to deliver excellent performance when you are doing vital fire and rescue tasks. The best ones function by letting your hands move with ease when rescuing while also giving them the love and protection they deserve during those dangerous operations. They can help retain your dexterity and safety so doing tasks like holding an ax and operating a hose will become more manageable. Furthermore, the glove’s function by helping you save your hands so these can do their ultimate task during a rescue operation – and that is to save the lives of those who are affected by a fire. Structural firefighting gloves – Primarily made with tough construction, this type of firefighting glove can give the ultimate protection to firefighters when it comes to dealing with tough structural blazes. It received the certification of either OSHA or NFPA as far as protection is concerned. 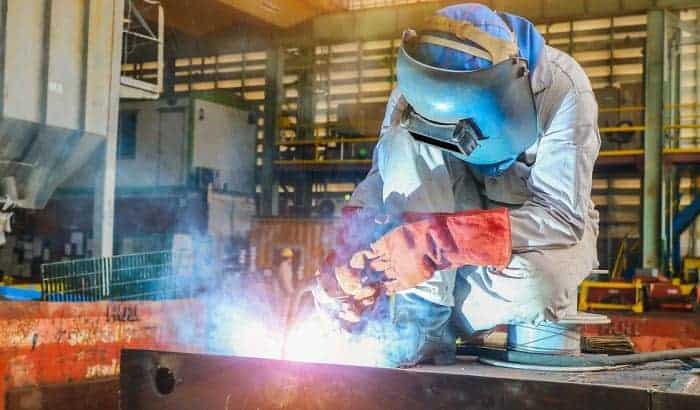 This certification indicates that the glove adheres to the standards set by the OSHA or NFPA in terms of creating structural firefighting clothes. Constructed from different materials while offering various levels of protection, most structural firefighting gloves also come with excellent abrasion and cut-resistance. It also takes pride in its heat-resistance and flame-resistance. This type aims to deliver the best protection and performance during those times when firefighters need these two traits the most. Wildland firefighting gloves – Based on its name, you can expect this glove to be often used when fighting wildland fires. It is designed in a way that it can protect you from extreme heat. It also takes pride in its extreme abrasion and cut-resistance. Furthermore, it is possible for it to provide amazing dexterity when you need to use firefighting tools. Extrication gloves – Another type of gloves for firefighting is that called as extrication glove. It is the glove that firefighters use when they are dealing with extrication operations. It is distinctive due to its impressive dexterity, and the ability to protect users from punctures, abrasion, and cuts. Proximity firefighting gloves – This type is often constructed from either Kevlar or aluminized PBI material. What is great about this is that it is built in a way that it can withstand or reflect the extreme radiant heat linked to burning fuel as well as other rescue operations for aircraft fires. Leather – Leather is, of course, one of the most famous materials used when constructing a pair of firefighting gloves. The leather used in protective gloves is also available in different kinds. One of these is pigskin leather, which gains recognition from a lot of users because it has a porous texture that maximizes its breathability. What is great about pigskin when used in gloves is that it is capable of withstanding moisture without the risk of the item becoming stiff. In fact, you have an assurance that it will get softer after every use. You can also expect the pigskin leather used in the glove to restore the natural soft texture once you wash or launder it. Another type of leather used in most firefighting gloves is goatskin. One incredible benefit offered by this material is that it offers double the durability of pig-grain and cow-grain leather materials. This material is also popular for its extreme softness while having the ability to provide maximum cut-resistance. There is also cowhide leather, which is the most common material used in creating structural gloves. What is remarkable about this material is that it provides a good amount of abrasion-resistance, sturdiness, and comfort. Regardless of the specific type of leather material used in creating the glove, take note that it is known for offering good puncture-resistance and friction grip. Any leather used in a firefighter glove will also undergo special processing to improve its flame-resistant nature during the tanning process. Some gloves are also constructed in a way that the leather materials are infused with silicone. This process is often necessary for firefighting gloves that are meant to be made with better durability and water-repellence than the rest. Synthetic fibers – You can also find firefighting gloves constructed out of synthetic fiber, like Kevlar. In most cases, this material is used instead of the leather material because of its incredible strength-to-weight properties. Manufacturers will most likely combine added reinforcements integrated at the back of the hand or the outer palm. It might also be added to interior layers to further boost their strength without increasing the weight. Firefighter gloves are truly among the most essential protective gears for all firefighters who work in different parts of the world. 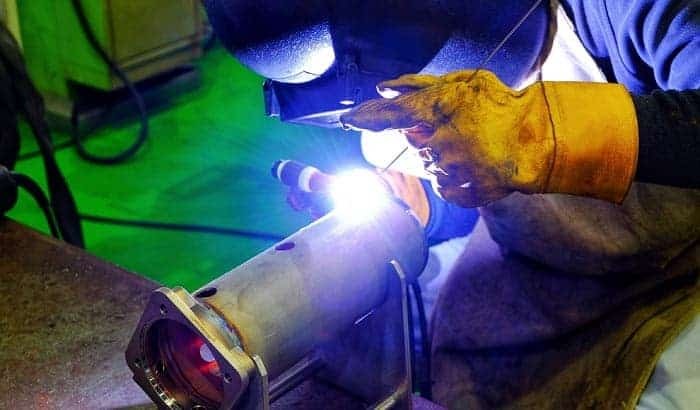 Keep in mind that your job requires you to combat a fire, so you also need to full protection to ensure that you have something, which will defend you without falter from harm. One vital reason why you need a pair of protective gloves specifically built for firefighting is that it promotes ease when you are performing your duties. You need a pair of versatile and sturdy gloves to do important tasks like swing an ax, run the jaws’ of life and spray a fire hose. You need the glove to defend you from a wide range of harm and dangers that you may face every day. It protects the most important part of your body in the workplace, which is your hands. By wearing the right firefighter gloves, you can reduce the risk of dealing with injuries caused by fire, cuts, abrasions, and steams. 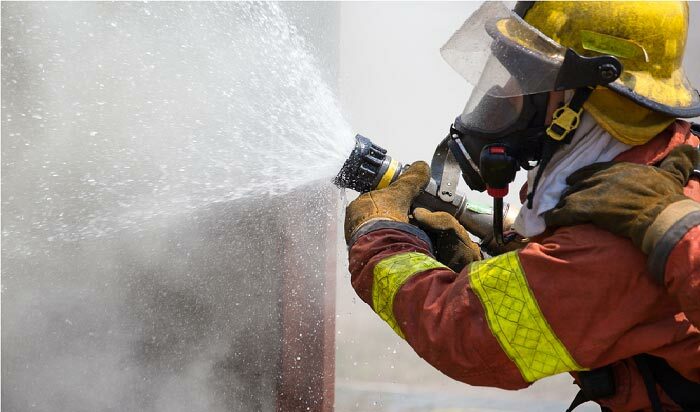 The best gloves, especially those that feature fire-retardant properties are beneficial as they can help you avoid the most popular injuries linked to firefighting. Note that extreme heat can cause your unprotected hands to be in danger. With the gloves on, you will have some sort of defense from the overwhelming heat. That said, it would be more manageable for you to fight fires without any trouble. Aiming to shop for high-quality yet cheap firefighter gloves? Then take note that there is no need for you to spend a lot to get a good pair. In fact, you have a good chance of investing in a firefighting glove which has the right balance between quality and decent price. Dexterity – One of the most essential factors that you should prioritize checking is the dexterity. This actually covers the palm and finger grip as well as the tactility of the fingertips and the flexibility of the fingers. You have to spend time assessing the level of dexterity as there are instances when the elements and properties used in the styling of the glove, like the fingertips’ adhesives, the seams’ location, or the bunching of certain materials at the glove’s palm, can significantly lessen its dexterity. Some features and elements in a particular glove design can also improve its overall dexterity. Among these are additional texture and seamless fingertips designed to enhance the friction of the grip. Some manufacturers may also add composite layers of the primary material to maximize the glove’s ability to protect the users’ hands. 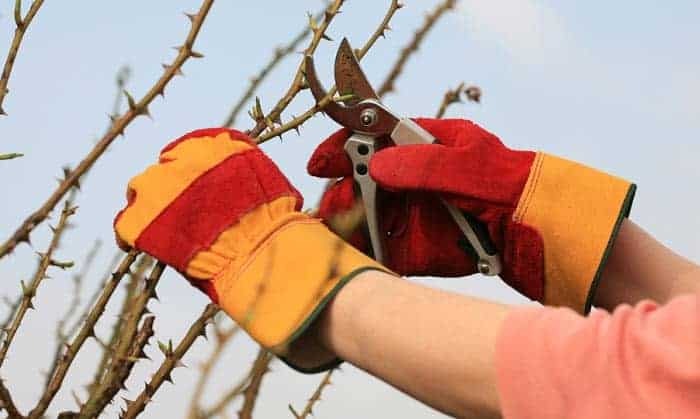 However, this can make the final output bulky and stiff, which might lead to the need to compromise either of the two – dexterity or hand protection. Also, take note that if the glove is designed in a way that you still have to remove it when doing specific tasks, like wearing breathing equipment or changing the frequency of radio then there is a great chance that your overall safety as a firefighter will be greatly affected. 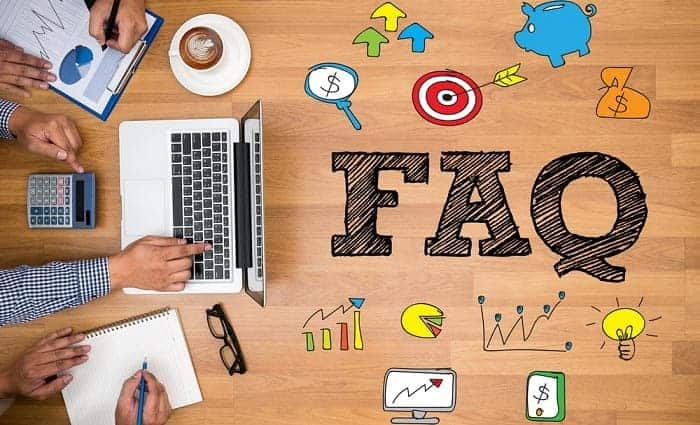 Fit – It is also crucial to spend time checking whether your choice fits you properly before you make your actual payment. One thing to remember about the fit is that a proper one can help ensure that you will receive enough protection without hampering the functionality and performance of your hands. What is great about most structural firefighting gloves today is that they come in various sizes. It is even possible for someone to customize the fit to ensure that it gives him a tighter and a more secure one. With a tight and proper fit, it is possible to enjoy a great sense of dexterity. The problem is that it might also cause the layers of the protective glove to compress, causing an impact in thermal protection. Thermal protection – Check whether your chosen glove has thermal protection, too. In most cases, this is part of the overall requirement for performance, which you can find at the back. If that happens then you should know that increased thermal protection can help firefighters who are burned. It could be that the back part of their hands got burned when they are clenching a hose line or tool. You can also expect the thermal protection to be a big help in protecting yourself from the radiant heat caused by a fire. In most cases, it comes in the form of an extra Nomex layer to the distinctive knuckle guard system of some gloves. If this kind of thermal protection is available then expect the firefighters to receive an additional level of protection from the specific places where they need such kind of protection. This will definitely protect your hand’s back in case you get exposed to excess heat. The firefighter glove is known to take more use and abuse when handling firefighting operations out of all your structural firefighting personal protective equipment. With the tough situations that your gloves have to go through, you need to give them proper cleaning, care, and attention. This is helpful in preserving their shape and fit and retaining their thermal protection properties. This is also the key to extending the glove’s lifespan. One thing that you should do to give your firefighter gloves proper care and attention is to check whether they are exposed to petroleum products or corrosive or toxic chemicals. You have to do this after each firefighting operation. If it is then you should separate it from your other protective gears until you can determine whether you can properly decontaminate it or if you need to dispose of it. In case blood or any other body fluids contaminated the gloves, separate it from your other safety gears, too. Make sure that they do not come close to your other items unless you were able to determine the infection-control policies specific to that equipment in terms of decontamination. When it comes to cleaning, you will find a stiff brush, which features plastic bristles helpful. One great choice is a tire brush designed to get rid of a lot of surface debris from your gloves prior to washing them. With the help of a stiff brush, scrub the glove’s shell. Use a mild soap solution during this step, too. In this case, you can use saddle soap, which has a special formula designed to give the leather material a gentle cleanse. What is great about this soap is that it is capable of preserving and retaining the natural oils present in the leather material used in your glove (if it is a leather-based one). This is also a major help in making the glove last for a long time. Do not use harsh industrial cleaning agents or soap as these can negatively affect how you preserve the oils in leather. Once done with cleaning and washing, you should air-dry your firefighting gloves. You can also make use of a low-temp dryer, such as a commercial hose dryer so you can ensure that the glove does not shrink. What are firefighter gloves made of? Firefighter gloves are actually made of a few components. In most cases, it takes advantage of the principles used for layering materials associated with garments. The gloves also apply similar 3-layer construction. One of its most important components is the shell, which can be constructed from either textile or leather material. Another component is the barrier layer or moisture barrier, which you can find within the shell. Most manufacturers combine it with a thermal lining while others create it as a separate or individual feature. All the layers added in creating the glove need to work together as a means of offering the ultimate answer to hand protection. In most cases, the primary material used in constructing the shell is leather. These include different kinds of leather, like goat, pigskin, elk, and cowhide, among many other specialty types of leather. You can also find shells constructed from the textile material, more specifically Kevlar. When this material is used, it is crucial to add more reinforcements to ensure that the shell will gain more puncture-resistance. As for the barrier, the material commonly used in it is a kind of Teflon or polyurethane. It is important for the material used in the barrier to not stretch or flex as much. This is the main reason why the barrier layers are usually created as permanent inserts. 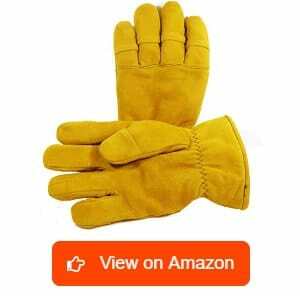 To provide comfort to your hands, you can also find gloves with a lining, which boasts of its main function that revolves around providing the required insulation. With the help of the other glove layers, it is possible for this to give complete insulation to your hands, protecting it from conductive, convective, or radiant heat exposures. Another possible component in the glove is the gauntlet or the knit wristlet. Often constructed from Nomex, the wristlet refers to a close-fitting found in the wrist. However, several firefighters find gauntlets more favorable than wristlets. You can also find reinforcements added to the internal layers or the shell of the glove. It is even possible for the palm areas to be reinforced, providing extra physical protection to your hands. Other gloves also have internal reinforcements that often appear as extra layers built into them to increase insulation in some areas, like at the back, which is the place where most firefighters anticipate high or extreme exposure to the heat. When are structural firefighting gloves required? Structural firefighting gloves are the most vital protective personal equipment for firefighters. 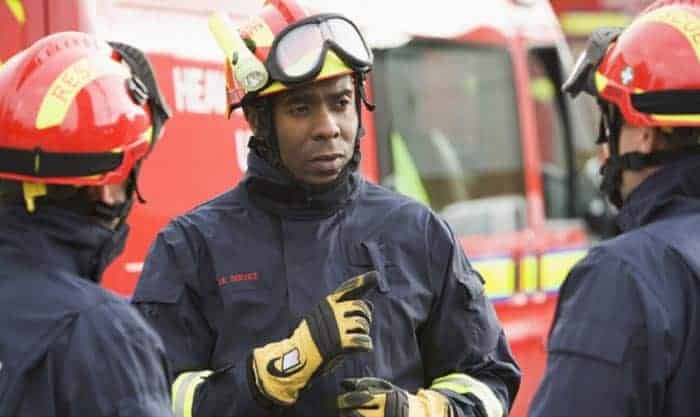 All firefighters and fire emergency rescuers are required to wear a pair of structural firefighting gloves before they lend their services to any fire emergency situations. Keep in mind that complete hand protection is necessary when you are firefighting. It is mainly because your hands are at the highest risk of getting injured or acquiring burns when you are responding to a fire. 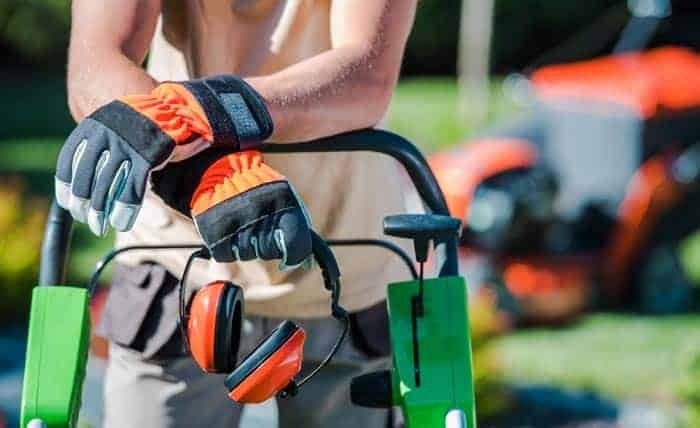 It is important for these gloves to have the adequate impact and thermal protection in case you are exposed to high-abrasion and high-heat areas. The structural glove also has to boast a comfortable, flexible, and lightweight thermal and liquid protection. Pro-Tech 8 Fusion versus Titan: What is the difference? The Pro-Tech 8 Fusion and the Pro-Tech 8 Titan are two of the most popular firefighting gloves at present. Now the question is, what makes the two different from each other? Are they capable of serving their purpose well? One of the major differences between the two is actually on the materials used in constructing them. Fusion actually makes use of the water-resistant goatskin leather material, which you can expect to remain flexible and soft even after drying. Titan, on the other hand, uses another type of leather for its outer shell, which is the 100 percent kangaroo leather known for its strength. Another thing that makes them different is the lining. The Fusion actually boasts of its full lining constructed out of Kevlar. This material is beneficial because it provides additional cut-resistance. Meanwhile, Titan makes use of 100 percent Nomex knit for its inner lining. Fusion also boasts of a very unique feature, which is the new PTFE moisture barrier. This barrier works in providing the highest viral and chemical protection while ensuring that your hands stay dry and keeping the glove as breathable as possible. Despite the differences, both gloves try to serve only one vital function – that is to maximize hand protection for the amazing firefighters who are trying to save the lives of people during fire emergencies. Do I need a firefighter glove strap? A firefighter glove strap is a necessity especially if you are someone who does not seem to feel at peace because you are constantly worried that your protective gloves will get lost. It is mainly because the strap can secure your gloves into a convenient spot instead of balling it up inside your pockets that might only increase their risk of getting lost. If you feel like having a firefighter glove strap can make you feel at peace when you are doing your job as a firefighter then consider investing in Lightning X Heavy-Duty Firefighter Glove Strap. 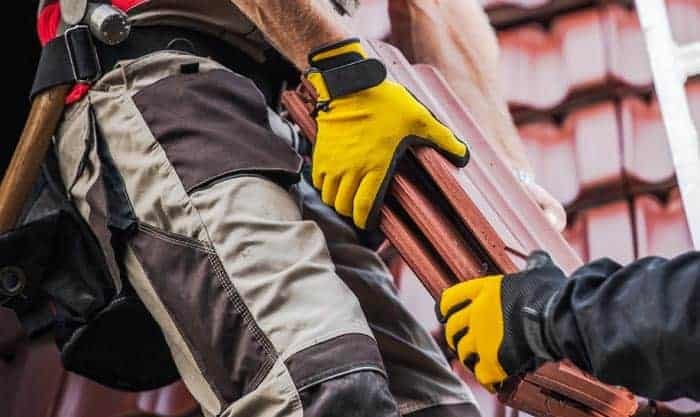 What is so beneficial about this strap is that it is specifically designed for bulky and thick work gloves, like the ones used by firefighters and welders. Constructed from heavy-duty and extra-wide ballistic nylon webbing, you have a guarantee that this strap is tough. It even features a sturdy snap hook, which you can use to attach the glove into a gear. Furthermore, it boasts of its fully functional hook & loop closure, which is effective in securing your firefighting gloves. It even comes with a Velcro, which you can use to extend up to four inches down each webbing strap. This promotes ease in making an adjustment if you plan to use the strap for various styles and sizes of work gloves. Choosing the right size is vital if you want your firefighter glove to perform two of its most important functions – to protect and offer comfort – well. You need to choose the right size to avoid ending up facing too much discomfort. 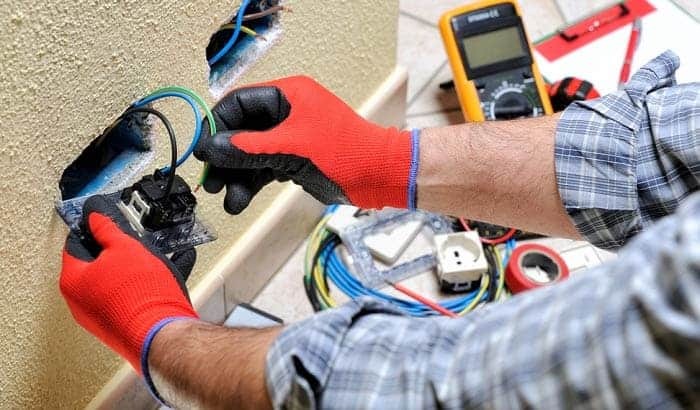 Make sure that the gloves have a correct fit so they can provide adequate amounts of insulation. Note that the trapped air within your glove serves as a perfect insulator and helps the item conform to your hand, making your hands deliver their important functions. It should not cause your fingers to spread apart because of the bulk in the fingers of the glove. It is because this might diminish its grip. In most cases, simple sizing mechanisms and schemes are not appropriate when searching for the right size of gloves for firefighters. With that in mind, it is advisable to measure the size of your hand on your own to get an idea about which size is truly appropriate for you. You can do that by measuring the length of your hand and the circumference of your wrist. Also, try to look for manufacturers and sellers who offer several sizes for the glove. You can also find companies that provide cadet sizing. This refers to a set of sizes that have shorter fingers. When you find yourself in desperate need for a high-quality pair and the best firefighter gloves, starting to shop and equip yourself with most information relevant to this product is a must. Fortunately, there is not a shortage of choices when it comes to gloves designed for firefighters and rescuers. With such a wide selection, finding the right place of firefighter glove that is compatible with your specific requirements is not that difficult.